My husband was into dirtbikes when I met him. I had a 4 y/o son at the time. He took me out riding, and let me use his Odyssey. I was hooked! My son rode around in front of him on the dirtbike. Then he got too big for that, and it was time to get him his own ride. Since he couldn't handle a 2 wheel bike, we got him a quad. 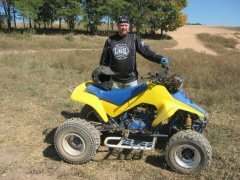 Since DH's dirtbike didn't do well with the slower speeds, he had to have a quad! I got pregnant, so I got an "offroad" golf cart to putt - putt trails with while the boys went riding. Now the baby is big enough to handle her own quad, and I got a real quad! The End. at the young age of 6 or so i started riding and that's ben my sport ever since!!! It was $5000. I think it was a '73. Its a V8. 351. Count the plug wires. If I would have bought the Stang I probably wouldnt have a drivers license anymore. LOL. My Dream car is a 68 Fastback. Shelby would be nice, but pretty much unaffordable for me. Not to mention gas is over $4 a gal now. Yeah, me too. But both those are well over 5 grand. I like 67 or 68 Shelby GT-500 like Elinore in Gone in 60 seconds. I think they were taking 68 Fastbacks and making them look like 67 GT-500s for the movie. I've alway been a Ford guy. Mostly 4x4s. 73-79s. But, recently been considering either a 73 or 74 Chevy 3/4 ton short bed for my next toy. Now, I gotta see if I can find some pix of some of my old Fords. Dont have these anymore. My 78 1/2 Ton Short Box And my 73 3/4 Ton Factory High-Boy (I miss that truck. the purple bronco? it was called "Crazy Horse"
Man where to start where to start. Well about hmm 7-8 years ago 1 of my cousin's had this yellow/blue like 250 forgot what brand. It might of been a honda. But after I rode it down thru the softball field parking lot/trails in the back/creek that gos thru a tunnel under the highway 3 storys down under ground. I couldnt get 1 till back in 2004 we live in the city like 15-20 mins from downtown ST Louis. So we was going to my dad's farm, and we looked over to harley dividson's building. They was having a BIG blow out sale out of all there stores around the STL area. So 2 days later dad, and me went over there. we would of thought there was only dirt bikes till we saw 2 ATV's in the back. So we went over there since we looked at everything else. They had a red honda 400 something "cant remember what model". It was damage they said it looked like a tree T-bone it lol. Then there it was a 2003 green polaris expolrer 400 w/ a snowplow the shinest it ever been "since i had it lol" Then dad, and me was talking saying. Well since we did buy are chevy, and mom's gmc I dont know if we can buy it. But after mom got off work we said "CAN WE HAVE IT??" she first said no. Then we showed her all the stuff on it, and what we could do with it. Then she finally said yes. 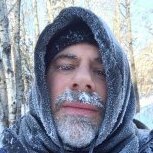 Boguht it for $5,000 I believe or $4.999 o well its close. But 2-3 weeks after we had it. I wrecked it. I was going full speed "With a helment" didnt know there was a BIG HOLE there. the grass was all level so I didnt see the hole. People said they saw me, then disappear. then see the atv fly up in the air then atv disappear, then they saw me fly in the air with my helment flying off, then I disappear. 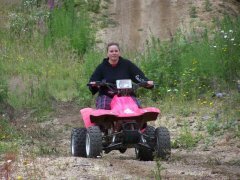 The atv then rolled over me but where the seat was it didnt hurt me. I walked away with alittle cut on my leg, and a headache.. We did repair it $300 damage not much tho. I was even scared to drive it since then 3 months later since it was sitting at my unlce's collecting dust. I finally said I'll ride it if I dont feel right with it we'll sale it. So while I was riding it around I was thinking all the good times I had with the short 2-3 weeks I had it. 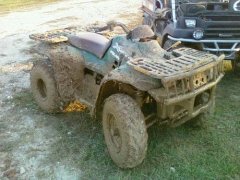 So I kept it, and take it to the mud runs at are cousin's farm about 2 time every year. Also take it down to are farm to ride it. 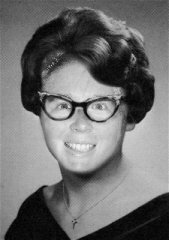 But I'll never forget that wreck. We still have it today. But it has been sitting at my uncle's for quite a long time. Theres has to be atleast 3 inches of dust on it. 1 day it will run in its glory days.....1 day. But we do need to take it out before sept. because mud runs coming up. Trucks? I love that show. Crazy Horse was Bad a$$. quite easily. The Doctor told me my balance was no longer good enuf for 2 wheels.....I can ride with the best of them, but it's too much work for my old heart. so I went to 3 wheels, then to four. It's a change, but it has been a BALL the whole way! nice folks everywhere! When I was like 16 years old, I had a couple of freind that had quads. King Quad 300 I think, with the lever shifts, is what was the beast back then. Some Hondas and some ATCs I remember. Never had money to get into the sport at that time. I was able to get my frist quad at age 24, a 1987 yamaha warrior. Used of course. Then I bought a 2004 Yamaha Kodiak 450. Finally I bought a 2005 Suzuki King Quad. No sooner did I read the last sentence of that email did I hit reply with a "HELL YEAH!!!!" Took delivery of that puppy in February '07.....WAHOO!!!!! Since then, I've joined 4 local clubs (lot of member overlap). Don't have all that many miles/hours on the quad, but get out when I can. It costs me close to $120 every time I want to ride with the upstate club (120 mile round trip....2 car tanks of gas...quad tank and 5 gal. can...trail fee), so I probably won't be riding much this summer if gas prices don't improve...GRRRRR!!!!!! Anyhoo...that's my story, and I'm sticking to it!!!!! Same age I started ridding at. 44. Everyone else started when the were much younger. Well I started about 15 years ago with a Honda 110 ATC. I bought it to go deer hunting. I loved it but that is all I did with it was go hunting. My father-in-law got a Honda TRX 200 "The Turtle" it is called that cause it had a trunk that kinda resembled a turtle shell. My brother-in-law had just bought a Blaster from his cousin's boyfriend so I had to have a quad. It turns out that the same guy the boyfriend "now her husband" his dad had a Lakota 300 that he wanted to get rid of. I got it and have been in love with riding ever since. I bought my son a 1986 Honda TRX 70 for Christmas when he was 8 or 9. He was well out of that within a year or so and we found him a 2003 Polaris Predator which he loves. 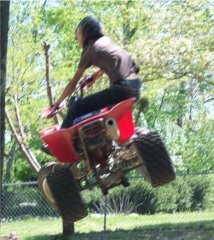 February 2006 I got a Suzuki LT250R and I love it but have been working on it more than riding it. My wife now rides the Lakota. 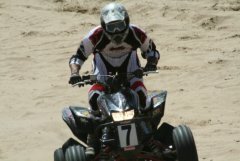 It is a great family sport and we have some of the best times riding. I just wish we could get out more. Trucks is an awesome show. I met Stacy a couple months ago at the Nashville Auto Show. He was great. I am a Ford guy too mostly. I have a 1994 Mustang GT I bought brand new. I am currently working on getting it back to perfect. I had a 1970 Mustang Mach 1 when I was 18 "man I wish I had that car back". It doesn't matter if you ride at 10MPH or 100MPH, as long as YOU are having fun. Stay within your abilities. I push myself most of the time, but I do spend some time on my back as well. My fellow club members are cool for the most part. They know I like to tool around, and they just wait for me after they're done mashin' their throttles. Nice, I usually wait for everyone anywhere there is a fork in the trail or a chance of going the wrong way. I'm always in front so I always find the obstacles for everyone else. So I'll wait and point them out so no one gets hurt.